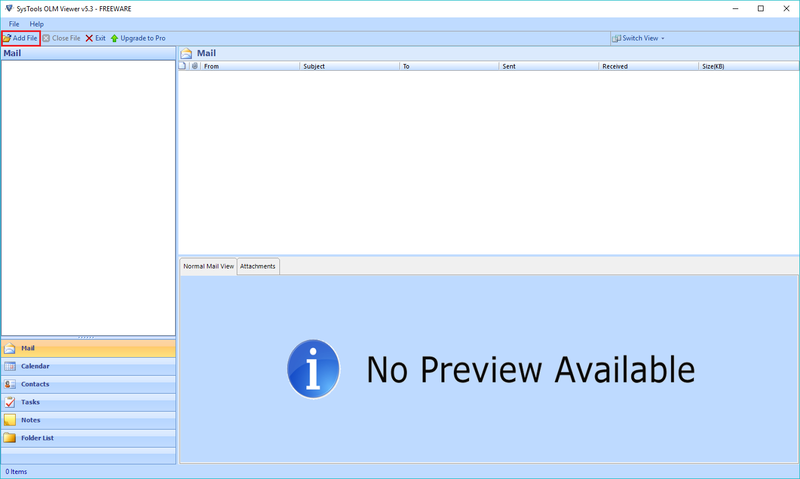 OLM File Viewer software performs quick scanning of OLM files and loads all of the folders consisting of emails like; Inbox, Sent Items, Deleted Items, Drafts, etc. By using this software we can easily open OLM file which is corrupted and unaccessible. OLM File Reader tool provides a unique feature to easily and quickly view OLM file without having Mac environment. It is an ultimate tool which doesn’t require any other supportive application to be installed on machine to read OLM file. OLM File Opener software will open OLM file and retains complete information associated with the file. While retaining the information the software will ensures that there is no loss of any kind of information like email attachments, read/unread status, appointments etc. Scan & Read Multiple OLM files of any size. Preview OLM file emails with attachments. OLM Viewer save the scanned OLM file for future use. View OLM file in the absence of Mac environment. OLM File Reader tool Scan & Load OLM Files in Batch. Supports Windows OS 10, 8.1 and all below versions. 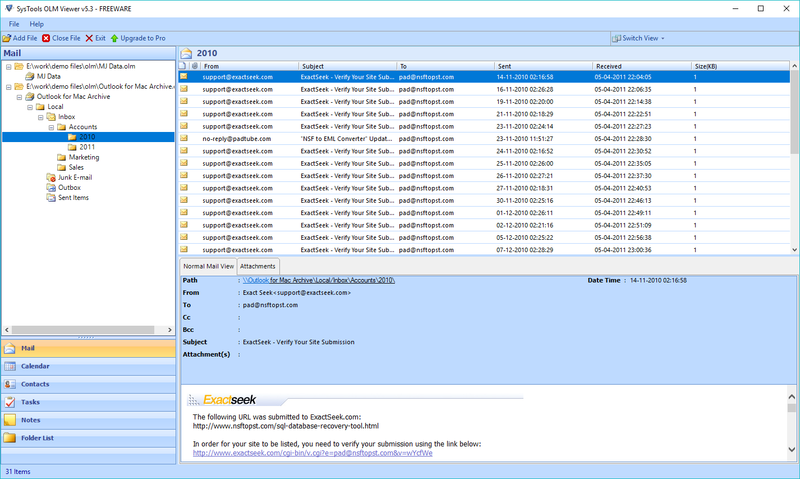 How can I open OLM File of Outlook for Mac 2011 & 2016 using OLM Browser tool? Step 1: Download & Run OLM File Opener Tool. Step 2: Click on Add File to browse OLM files. Step 3: The software will Quick Scan OLM File to show emails and attachments. Is it possible to open OLM file without having Mac OS by OLM Viewer Tool? Yes, OLM File Reader software provides an exclusive feature to read OLM file without having Mac environment and also it doesn’t require any supportive application to be installed on the machine. Would I be able to view email attachments with this OLM File Viewer Tool? 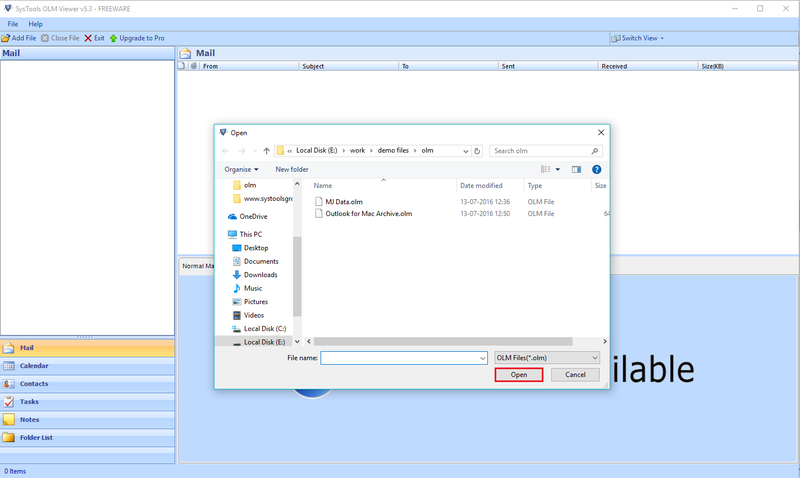 Yes, by using OLM Reader tool you can easily open and view the mails along with attachments of OLM file. Can I run this tool on my Windows 10 computer ? Yes, being a Windows based utility the OLM Viewer is compatible with all Windows Operating System versions. Can I use OLM Browser tool on Mac Machine? No, OLM File Viewer is completely a Windows based utility i.e you can run it only on Windows platform. Is it possible to view corrupted OLM File of Outlook for Mac 2011 & 2016 by OLM File Reader tool? Yes, OLM File Opener software helps to open OLM File which is corrupted and also this software provides an exclusive option to read OLM file by removing the corruption from each of its sectors. What Client Says About OLM Viewer Tool? “OLM File Viewer is a great software to view OLM file of Outlook for Mac 2011 & 2016 of any size. 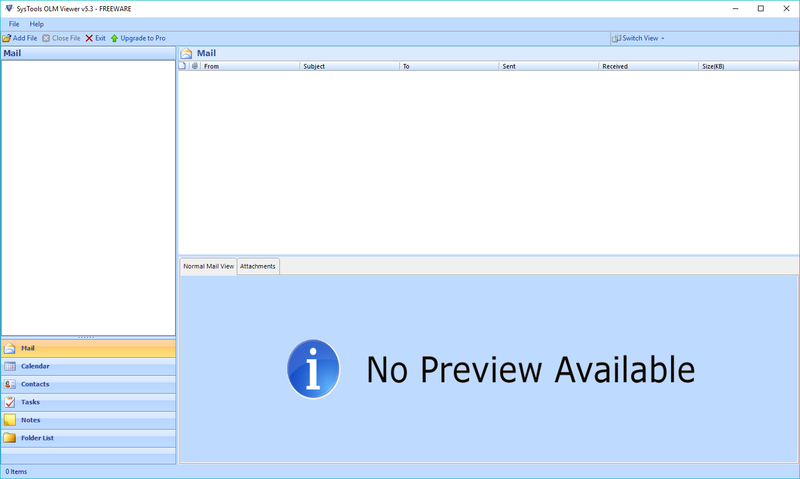 OLM Viewer provides complete mail view along with its attachments. I feel that it’s not possible to view OLM file on windows platform. But this exclusive software make it possible with such sheer ease. I used this tool and found that OLM File Reader is very helpful and user friendly tool."